Last night, as my wife and I walked along Golden Gate Drive, we spotted two felines—one (white) lay across the entryway, and the other (smokey) sat sphinx-like on the steps—at a beautiful home with open-wide front door. 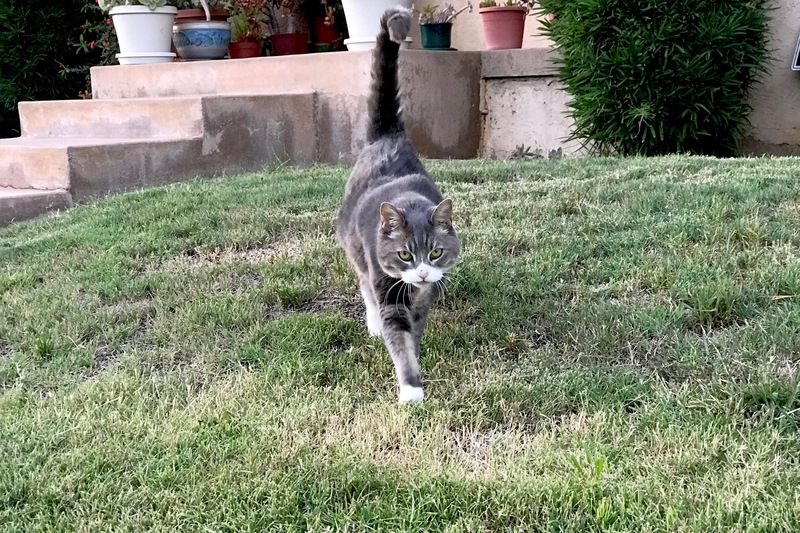 As we passed, the grey kitty got up and stretched, and I thought surely he would come out to the sidewalk for attention. I beckoned Anne to stop, and as she turned back he strutted across the lawn. The iPhone 7 Plus in hand, I had been trying to get a closer on-the-steps shot; the second lens acts as 2x optical zoom. Hence, the Featured Image, which I almost discarded because it isn’t sharp and reminds me of the mushy output quality I would get from 3-megapixel cameras more than a decade ago. Is it coincidental, or something more, that my last few evenings of low-light photos are similarly noisy, all after upgrading to iOS 11, where HEIC (so called High Efficiency Image File) replaces JPEG as default camera capture format. I later got off two snaps with Leica Q; neither made the cut. In one, the cat’s head is blurry from motion (but not the rest of his body). In the other, focal point is grass beyond him. My bad; camera can’t be blamed. I mishandled the equipment, by not manually increasing the shutter speed, nor taking extra seconds to manually focus. BTW, ChaCho is at least 14 years old, according to his owner. The friendly feline was a rescue cat, and he brought the name with him. I captured his moment at 6:31 p.m. PDT—six minutes before sunset. Vitals: f/2.8, ISO 160, 1/60 sec, 6.6mm. Don’t miss: Scruffy, Roly Poly, Woo, Skull, Biscuit, The Colonel, White, Chipper, Frisky, Stretch, Needy, Farfisa, Mates, Hunter, Pee-Pee, Blue, Blue Too, Bonded Pair, Patience, Fess, Jumper, Frenemy, Looker, Cozy, Scout, Lurks, Skit, Mini, Betty, Black and White, Stalker, Bell, Chill, Sammy, Scratch, Poser, Star, Grey and White, Watcher, Herman, Comet, Roman, Willow, Chub, Nimbus, Watson, Lilo, Kit, Pepe, Twilight, Sebastian, Spot, Booger, Ash, Veruca, Riley, Mellow, Bonde, Flower, Glass, Black, BeBe, Fang, Bruce, Siamese, Pounce, Tortie, Haiku, Fraidy, Peso, Daniel Tiger, Dusk, Stride, Dainty, Spry, Tabby, Betty Too, Still, Levi, Shadow, Sophie, Wink, Ferals, Momma, Charlie, Tux, Cool, Benny, Jellicle, Itchy Valentino, Goldie, Nine, Amanda, and Siesta.